After devastating natural events, we watch and wait. That’s really all we can do. After all, we are no match to lightning fast winds, and rushing waters. Through these events, Nature shows its strength, power, and ultimately, its resilience. As raging storms whip through landscapes, toppling firmly rooted trees and flipping branches like pancakes, we get a glimpse into Nature’s intense energy. On Vieques, a tiny, rural island 8 miles east of Puerto Rico, stands La Ceiba, a 400-year-old kapok tree. Just imagine all that this tree has experienced in its lifetime. Once inhabited by the Arawak Indians and later a haven for pirates, Vieques became a sugar plantation, toiled by the hands of slaves. The U.S. Navy claimed the island for military training, leaving Vieques full of toxic pollution. 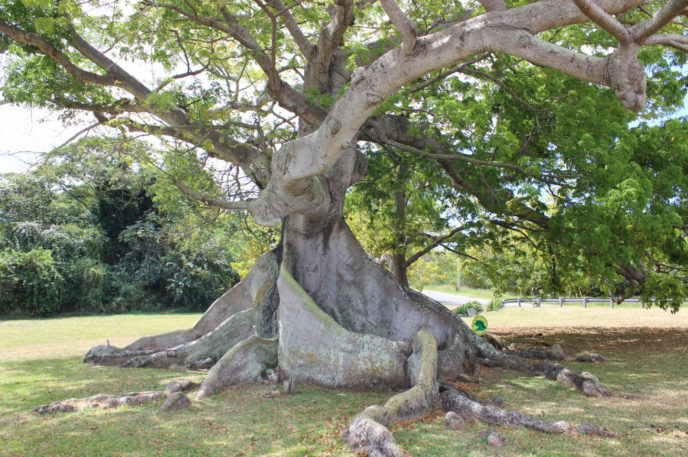 Through all of this turmoil, Vieques recovered, and its famed tree, La Ceiba, continued to grow—the first testament to Nature’s resilience. Vieques became home to flora and fauna, including turtles, seabirds, wild horses, endangered manatees, tree frogs, hummingbirds and regional plants. Deep bowls formed by La Ceiba’s thick roots collected rain water and served as a resting spot for wild animals on the island. Its buds attracted bees, birds, bats and spiders. But as idyllic as it may seem, this coastal island still encounters Nature’s fury. In 2017, Hurricanes Irma and Maria whipped through Vieques, barraging the island with 120-mile-per-hour winds. Mudslides followed, washing away homes, businesses and roads and leaving the island with only generator-driven power for eleven months. Many trees were stripped of their foliage and many others were uprooted. Much of the island was left underwater, destroying 80% of its crops in just a few hours. La Ceiba was left bare and exposed. Its leaves were gone and most of its smaller branches and some larger ones were broken. Needless to say, this natural disaster was devastating. All hope seemed lost. But about 18 months after the hurricanes, this waterlogged island began to reclaim its beauty. In early March 2019, onlookers observed light pink night blooms on La Ceiba for the first time since the hurricanes. These blooms have now turned into large seed pods. Even through the most devastating disaster, Nature prevails. We see its resilience, and through this strength we see hope—for a better future, for a new path, for a beautiful journey. The story of La Ceiba’s resilience is a message we can keep with us always. Even in the darkest of times—the natural disasters that bombard our human lives—we are stronger and more resilient than we may seem. And when we fight our way back and begin to regrow, we come back stronger than we ever were before.